John Adair (January 9, 1757 – May 19, 1840) was an American pioneer, soldier, and statesman. He was the seventh governor of Kentucky and represented the state in both the U.S. House and Senate. Born in South Carolina, Adair enlisted in the state militia and served in the American Revolutionary War, where he was held captive by the British for a period of time. Following the war, he was elected as a delegate to South Carolina's convention to ratify the United States Constitution. He then moved to Kentucky, where he acquired a large farm, and participated in frontier wars against the Miami Native Americans. Adair became active in Kentucky politics, serving a total of eight years in the state House of Representatives between 1793 and 1803. He served as Speaker of the Kentucky House in 1802 and 1803, and was a delegate to the state's constitutional conventions in 1792 and 1799. He ascended to the United States Senate to fill the seat vacated when John Breckinridge resigned to become Attorney General of the United States. Adair's promising political career was threatened when General James Wilkinson accused him of being involved in the Burr conspiracy. Although Adair was later cleared of any wrongdoing and Wilkinson was ordered to issue an apology, Adair was forced to resign his seat in the Senate, and the negative publicity kept him out of politics for more than a decade. Adair's participation in the War of 1812 restored his reputation, and he returned to the state House in 1817. His commanding officer in the war, twice governor Isaac Shelby, appointed him adjutant general of the state militia. In 1820, Adair was elected governor on a platform of financial relief for Kentuckians hit hard by the Panic of 1819. His primary measure toward this end was the creation of the Bank of the Commonwealth. Many of his other financial reforms were deemed unconstitutional by the Kentucky Court of Appeals. Following his term as governor, Adair served one term in the United States House of Representatives, but did not run for re-election. He died May 19, 1840, at his farm in Harrodsburg. He is the namesake of several places, including Adair County, Kentucky, Adair County, Missouri, Adair County, Iowa, and the town of Adair, Iowa. John Adair was born on January 9, 1757, in Chester County, South Carolina, the son of Scottish immigrants Baron William and Mary (Moore) Adair. He was educated in the common schools of Charlotte, North Carolina. He served in the state militia in the Revolutionary War, and was held as a prisoner of war by the British. Following the war, he was a delegate to the South Carolina convention to ratify the U.S. Constitution. In 1784, he married Katherine Palmer. The couple had twelve children, ten of them daughters. In 1788, Adair moved his family to Mercer County on the Kentucky frontier. In Kentucky, he continued his participation in the militia in their campaigns against the Miami Native Americans. He enlisted with the rank of captain, but was promoted to major under General James Wilkinson and to lieutenant colonel under Charles Scott. He fought in several campaigns against various Indian tribes, including a hard-fought defeat to Chief Little Turtle near Fort St. Clair in Ohio. Adair was a delegate to the Kentucky constitutional conventions in 1792 and 1799. 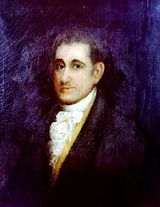 Upon Kentucky's admission to the Union, he was elected to the Kentucky House of Representatives from 1793 to 1795. He would serve in that body again in 1798, and from 1800 to 1803. In 1802 and 1803, he presided as Speaker of the Kentucky House. In 1805, Adair became registrar of the United States land office. Later that year, he ascended to the United States Senate to fill the vacancy left when John Breckinridge resigned to become Attorney General. His close association with Aaron Burr during the Burr conspiracy damaged his credibility, and he lost the election for a full term in the next year. He immediately left the Senate, resigning on November 18, 1806. In December 1806, Adair departed for Louisiana to inspect a tract of land he had purchased. On his arrival in New Orleans, he was arrested on the order of his former commander, James Wilkinson, who charged him with disloyalty. Adair counter-sued, and in a court battle that spanned several years, it was revealed that Wilkinson had no actual evidence against Adair. Wilkinson was ordered to issue a public apology and pay $2,500 in damages to Adair. At the outbreak of the War of 1812, former governor Isaac Shelby asked Adair to serve as his aide. Adair rendered commendable service in the Canadian campaign, most notably at the Battle of the Thames in Ontario, in 1813. The following year, he led 1,100 Kentucky riflemen in support of General Jackson's expedition that ended with the victory in the Battle of New Orleans. His participation in the War of 1812 restored his reputation. He returned to the state's House in 1817, was appointed adjutant general of the state's militia, and was brevetted to the rank of brigadier general. A period of land speculation followed the war. In response, the federal government created the Second Bank of the United States. The bank's strict credit policy hit Kentucky hard, and contributed to the financial Panic of 1819. In the gubernatorial election of 1820, Adair ran on a platform of bringing relief to the state's debtors. He was elected over three fellow Democratic Republicans: William Logan, Joseph Desha, and Anthony Butler. During his term, several banking crises and recession brought the state government near to failure, and many of his administration's actions were related to the state's financial troubles. He oversaw the abolition of the practice of debt incarceration, and sanctioned rigorous gambling legislation. Perhaps the most important measure implemented during Adair's administration was the creation of the Bank of the Commonwealth in 1820. The bank made generous loans and issued paper money. Creditors who refused to accept notes issued by the bank were prohibited from pressing their claims for two years. Many of Adair's other relief measures were struck down as unconstitutional by the Kentucky Court of Appeals, the state's highest court at the time, because they impaired the obligation of contracts. Among Adair's accomplishments not directly related to finances were the establishment of the state's university system and endorsement of the Missouri Compromise. He advocated for prison reform and better treatment of the insane. He also oversaw the enactment of a plan for internal improvements, including improved navigation on the Ohio River. Following his term as governor, Adair spent most of his time on his farm. He did make one more appearance in national affairs, when he was elected to the U.S. House as a Jackson Democrat for the 1831 to 1833 term. During his term, he served on the Committee on Military Affairs. He did not run for re-election. Adair died at home in Harrodsburg, but in 1872, his grave was moved to the Frankfort Cemetery in the state capital. Adair County, Kentucky, Adair County, Missouri, Adair County, Iowa, and the town of Adair, Iowa, were named after John Adair. In his early life, John Adair was known as a skilled soldier. Adair would partake in other military forays in his lifetime. Early in his adult life, however, he would turn his attention to politics. He filled several posts during his lifetime and was committed to accomplishing positive goals for the benefit of his constituents. His memory is honored in the form of several townships and municipalities named for him. ↑ United States Congress, Adair, John. Retrieved October 3, 2007. ↑ National Governors Association, Kentucky Governor John Adair. Retrieved March 9, 2007. Collins, Lewis, J.A. James, and U.P. James. History of Kentucky. Lexington, KY: Henry Clay Press,  1968. National Governors Association. Kentucky Governor John Adair. Retrieved March 9, 2007. Smith, Zachary F. The Battle of New Orleans, Including the Previous Engagements Between the Americans and the British, the Indians, and the Spanish Which led to the Final Conflict on the 8th of January, 1815. Louisville, KY: John P. Morton & Company, 1904. United States Congress. Adair, John. Retrieved October 3, 2007. ADAIR, John, (1757 - 1840) Biographical Directory for the United States Congress. This page was last modified on 12 May 2018, at 21:52.